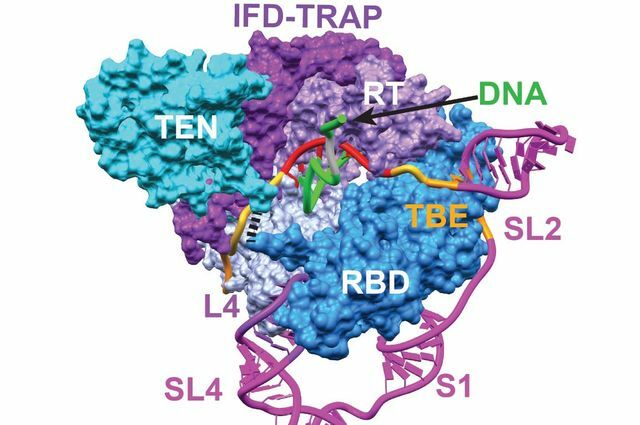 “For the first time, we have a framework, or blueprint, of telomerase,” said researcher Lukas Susac. Telomerase's "catalytic core" is illustrated here. 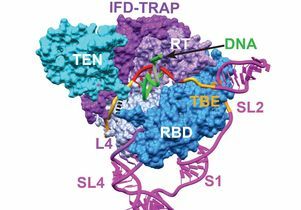 In addition to reporting the highest level of detail ever seen of the structure of telomerase’s catalytic core, shown in the animation below, the researchers report for the first time they have captured telomerase in the process of making DNA. Cells with abnormally active telomerase can continually rebuild their protective chromosomal caps and won’t die, said Feigon, who also is a member of UCLA’s Molecular Biology Institute and an associate member of the UCLA–Department of Energy Institute of Genomics and Proteomics. Over time, this is harmful because DNA errors accumulate and damage cells. Telomerase is especially active in cancer cells, which enables cancer to grow and spread. The researchers report for the first time the structure, shape and significance of TRAP, and the region with which it interacts. The scientists used a technique called “cryo-electron microscopy” that enables them to see the enzyme in extraordinary detail, and used computational modeling to interpret their data. The research team has expertise in several fields, including biochemistry, molecular biology, computational biology and biophysics. 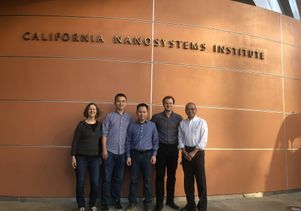 Other authors are Jiansen Jiang, a co-lead author and a former UCLA postdoctoral scholar, now at the National Institutes of Health; Yaqiang Wang, a co-lead author and UCLA postdoctoral scholar in Feigon’s laboratory; Henry Chan, a former UCLA graduate student in Feigon’s laboratory; Ritwika Basu, a UCLA postdoctoral scholar in Feigon’s laboratory; and Z. Hong Zhou, director of the Electron Imaging Center for Nanomachines at the California NanoSystems Institute at UCLA and a senior author of the paper. The research was funded by the National Institutes of Health, the National Science Foundation and the UCLA Clinical and Translational Science Institute, which is supported by the National Institutes of Health’s National Center for Advancing Translational Sciences.